Microbes: messengers for weight loss & gain? 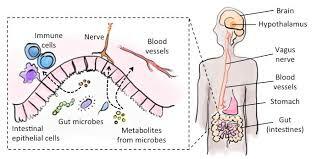 Once again -- through a series of coincidences -- I stumbled across some medical information about the power of the microbes in our digestive tract to influence what we eat and consequently how we feel. I am going to follow the guidance of some imminent medical doctors and medical researchers to change what I eat in order to diminish the presence of harmful microbes and feed microbes that are beneficial to my health. For many humans, foods with high lectin levels are not healthy, but also feed the harmful microbes. Double whammy. These high lectin foods include my beloved tomatos, eggplant, red and green peppers, cashews, beans, and legumes. And most grains including rice, wheat, potato. I am on a mission to lighten my body as I enlighten my soul, heart and mind. My microbes are going to go on this journey with me. How are my microbes going to help me? Every microbe has a soul, and I am going to conduct a conference with them by saying hello to them, and then asking them to move into balance and alignment for the best possible health of my body who hosts them. I will send them messages of love and gratitude, and ask them to only send messages to my brain that align with my eating the healthiest food for my body. The scientists have shown that the microbes can adapt to take nutrients from whatever humans eat, but some of them prefer quick nutrients from starches and sugars. Don't I know it! Along with Master Sha's Weight Loss CD (found in Soul Communication) and the principals of Tao Science, I should be in good hands and in better shape. If you need to analyze your time use, and make more time for whatever you love doing, including your spiritual practices, you might want to plot your activities in a spreadsheet. 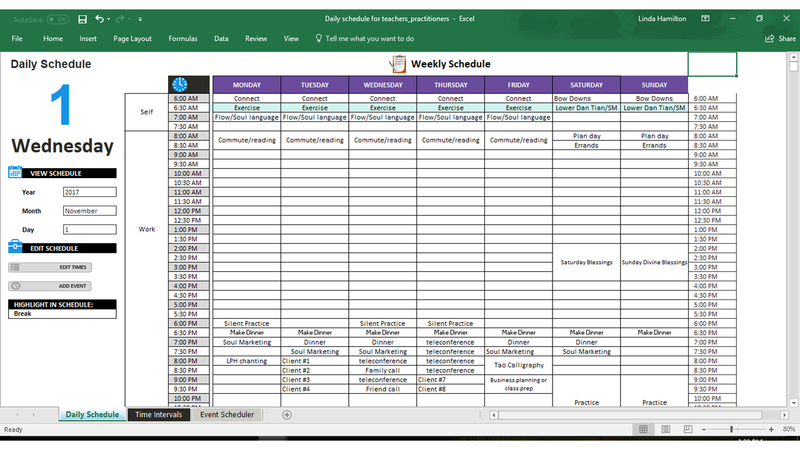 Microsoft provides a daily scheduling template, that I adapted. I hope it serves you well. Adapted from a Microsoft Excel template. ​Gratitude is thought of as thankfulness or appreciation, even indebtedness. Pure gratitude is unconditional. Gratitude is the message of love offered by any soul to another, often for good service. That service may be provided by the planets, stars, galaxies and universes, by spiritual beings, sentient beings and all of nature. This message of love and thanksgiving melts hearts and makes way for even more gratitude. Gratitude builds a foundation for living well. In spiritual practice, our gratitude is nourishment for Heaven and for our own soul, heart and mind. Gratitude is a quality, one of the ten greatest (da) qualities for humanity to cultivate to become pure souls. In Mandarin we say, Da Gan En, Greatest Gratitiude. ​The emotion of gratitude is a feeling of happiness stemming from appreciation for the present moment, present experiences, possessions, relationships, circumstances, including the memories of those things. Gratitude is said to put one's expectations into perspective and will therefore reduce the experience of suffering from a sense of lack or limitation. As seen from the lens of gratitude, we have enough. Heaven and the Divine never fail to support us with instructions, if our hearts and minds are open to receive. Tonight I received a most astonishing message in the form of a song. I was in Master William and Master Alma's Thursday evening class, attending remotely. At the end of their classes they often offer a treasure, like the Crown Chakra blessing, to one of the students in class, chosen at random (by Heaven) as a gift. Though one precious student was chosen to receive this blessing, I believe that all of us received some level of blessing through this powerful treasure. 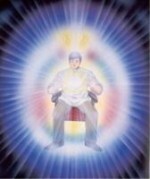 It was a huge treasure to re-balance all of the soul houses, or major chakras, in the student's body. Sitting many many miles away, I experience the wave from that Crown Chakra blessing, and recognized via direct knowing that Guan Yin, known as the goddess of Compassion, was administering this blessing to me. I could see Guan Yin's pale and slender hand over my head. Then came the message: Peace I give to you oh Lord. The message -- delivered as a packet of thoughts -- suddenly unpacked itself as a song. I have spend the rest of the night chasing down that song. It is Peace, sung by the monks of the Weston Priory, Weston, Vermont. peace the world cannot give. so that your joy be ever full. I do not know exact where I heard that song before. Perhaps it was in a folk mass, and I have a dim recollection of going to the Weston Priory, but the memory was buried so deep it did not appear again until tonight. You will find and may order the monks beautiful music here. I will also add a sample to my website soon, so you can enjoy the rich melody and the words. 26 But the Comforter, who is the Holy Ghost whom the Father will send in My name, He shall teach you all things and bring all things to your remembrance, whatsoever I have said unto you. 27 “Peace I leave with you; My peace I give unto you, not as the world giveth, give I unto you. Let not your heart be troubled, neither let it be afraid. 28 Ye have heard how I said unto you, ‘I go away and come again unto you.’ If ye loved Me, ye would rejoice because I said, ‘I go unto the Father,’ for My Father is greater than I.
I think there is a message here for many people. Let us celebrate the resurrection of Jesus, the Christ, by sending forth the message, song and essence of Peace. to be the hope for all mankind. the Spirit of our love I bring. all men will know you are my friends. and you will live with hope and joy. I share with you the Father’s love. and have it to the full. and our home we’ll make with you. © 1971 The Benedictine Foundation of the State of Vermont, Inc.
Master Sha teaches us that Jing qi shen xu tao is matter, energy, and soul transformation. Jing Qi Shen Xu Tao is a 5 word sacred wisdom, concept, chant and practice. Everything is made of matter, energy and soul, or Shen Qi Jing. If you have good health, then you have high quality Shen Qi Jing. If you are sick or have challenges in relationships or finances, you have blockages of Shen Qi Jing in those areas of life. This process of transformation from jing to qi to shen to xu to tao is the evolution of matter, energy, and soul. This is a Taoist practice, however, many Taoist practitioners throughout history have not clearly understood how to transform jing to qi to shen to xu to tao. Master Sha has released this sacred wisdom to make it possible for humanity to reach the Tao state. These are the spiritual steps for everyone to take to transform Jing to Qi, Qi to Shen, Shen to Tao. This morning I was doing some chi movement when a message came into my mind from out of the blue. "Serving others is LIFE SAVING for them. Serving others is LIFE SAVING for you." Serving others means being open and loving, being patient, joining them in moments of laughter and sorrow, being there for others, uplifting others, and doing the spiritual practices that I have vowed to do to offer blessing, healing and transformation to all. I instantly apologized to Heaven for the times I had doubts that what I do makes any difference, and for not honoring the powerful treasures I have within me in those moments of doubt. The purpose of life is to serve. Serve with all your heart, with your whole heart. Sing out loud, dance with abandon, smile broadly to drive home the joy of living each and every day. Share the joy of living with every Heart you meet. Include your own dear Heart where your Source resides. we have to open our hearts further and further. Here are some practices to open the heart. 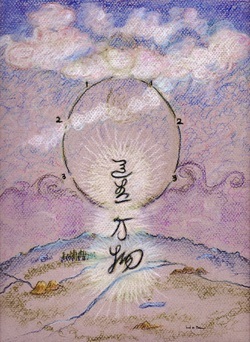 Meditation on Twin Hearts created by Master Choa Kok Sui, founder of Pranic Healing. The link will take you to a mini-version (about 10 minutes long) of the full Meditation, read by Master Sui's disciple, Master Stephen Co. Listen to Master Sha's Tao Song to further open your heart (6 minutes). The meditation audio file by Padmacahaya: International Institute for Inner Study can be purchased & downloaded from iTunes or CDbaby.